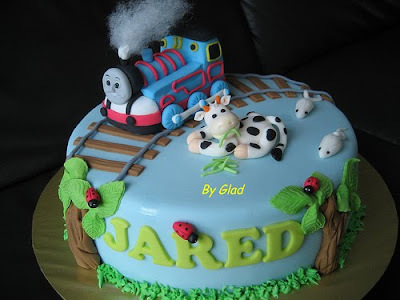 Jared's mom only needed the train to be on railway track and light blue colour.... I added a cow and two rats in .... was thinking Jared is born in year of rats and hence made two rats for him to represents two y.old (oh boy, just got to know that I was wrong.... it's pig). Lesson learnt, don't anyhow thing! Thank god, this is extra I put in and not in the requirements. Hi Ultraman vs Doreamon. Please check your mail box. Thanks. Can I know how much you charge for single-tier Thomas train & friend cake? What flavour of the cake? My guests less than 20ppl. My son's birthday celebration will at either 18 or 19 Sept. Are you available on tat date? Hi Sharon, have replied your email. can i check with you how much you charge for this thomas and friends cake? my son birthday is on 20th aug. is it alright? Hi! Have sent you an email :) Thank you. How much you charge for this cake? my son's birthday is 14 Apr. Hi, can I know your charges for the thomas cake? Single and double tier? my boy's bday is in dec. pls mail me at thommye@hotmail.com. thks! May I know how much u charge for a single tier thomas? I am very interested in ordering this cake for my son's birthday party on 4 Jan 2013. I am wondering how much will this cost? can you email me at dewhaze@hotmail.com? How much is the cake posted in 1kg? And how long in advanced do I have to place order? Hi Sherry. Sorry to inform that i am not taking orders now. Thanks for asking.